There is a myth that a homemade carrot cake recipe must be difficult to make, which is why many people choose to get their carrot cakes from the store. Not only is that unnecessary, it simply isn’t true—and this homemade carrot cake recipe will prove it. This is a simple-to-make cake recipe that delivers delicious results. If you have tried to make a carrot cake at home before and it did not turn out quite right, or if you haven’t had the courage to give it a try yet, now is the perfect time with this delicious yet simple cake recipe for carrot cake at home. As you can see, it uses very common household ingredients and you can have it ready in under 1 hour! Use a medium glass mixing bowl to combine the sugar and vegetable oil. Next, beat in one egg at a time and add the vanilla. In another mixing bowl, combine the rest of the dry ingredients. Next, combine the wet ingredients with the dry ingredients and mix in the carrots. Pour this mixture into a lightly-greased baking sheet. Bake for 35 minutes, or until you can poke it with a toothpick and the toothpick comes out clean. That is the standard, universal test for telling if a cake recipe is finished baking yet or not. There you have it! 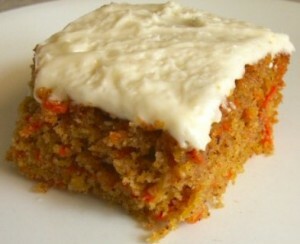 Enjoy your fantastic homemade carrot cake recipe and don’t forget to share some with your friends. Keep an extra copy of this cake recipe as well—you’ll certainly be sharing it! Since it only took about an hour, what are you going to do with all of your extra time? Carrot cake recipe‘s defy the saying that healthy and tasty cannot go hand in hand. This healthy carrot cake recipe is packed with the nutritious benefits of carrots and different spices, which not only gives a wonderful taste but is also easy to make at home. Note: You can increase or decrease the amount of spices depending on your taste. However, make sure that you do not completely mask the taste of the carrots. Whisk the eggs and sugar in a deep bowl. Add the molasses to the mix and beat well using a blender. In a separate bowl, sift together the flours, baking soda and baking powder and keep aside. Add the orange juice, orange zest, grated lemon zest and grated carrot to the egg mix and fold well. Now add the flour mixture, one spoonful at a time, and mix well between each addition. Now add the raisins, figs, poppy seeds, pecans and cinnamon powder to the mix and fold well. Let it rest for a minute or two so that all the dry ingredients are moistened. Grease a 9-inch baking pan and dust the insides with refined flour. Pour the batter in the baking pan and bake in the preheated oven for 1-1½ hours. If the top of the cake is firm, then the cake is done. Cool for at least 30 minutes before taking it out of the pan and cooling completely. Because of the vegetable oil, the cake can be stored in the refrigerator and will remain moist. When serving, warm the cake piece in the microwave for 10 seconds. Warm the cake and serve it with chocolate sauce on the side. Cream cheese icing is the traditional way to serve healthy carrot cakes. Cut the cake into fingers and decorate with jam and gems to serve to children. Growing up, the month of march meant two things in my home; my father’s birthday and a small carrot cake. It was just enough for two hearty pieces because my mother never cared much for carrot cake, and I have no memory of her ever having any. Fast forward to last year when Mom reached into the oven to pull out a large baking pan and proceeded to cut three pieces. We looked on, surprised, until she told us she had found a delicious, healthy carrot cake recipe to try. Thanks to this healthy carrot cake recipe I’m going to share with you, she has been converted. It may have something to do with the delicious berries that you don’t often see in a carrot cake recipe, or perhaps the almonds or the delicious blend of spices. Whatever it is, this carrot cake recipe is an absolute winner. Not to mention it’s a lot better for you than traditional carrot cake recipes. Does healthy mean you reap the benefits of a smarter recipe, or does it mean you can just have much bigger pieces and not feel bad about it? That’s entirely up to you, but I dare you to not go back for seconds. The first thing you need to do is preheat your oven to 350°F (180° C). Next, oil your baking pan and boil the water in a pan. Once the water is boiling, add your orange juice concentrate and stir in the dates. Remove from heat and bring the water, juice and date mixture to room temperature. Whisk together the flour, bakina soda, baking powder and salt in a mixing bowl. Pour your batter into your baking pan and bake for approximitely 50 minutes. .. And the most important step, naturally, is to enjoy this delicious carrot cake recipe with your friends!